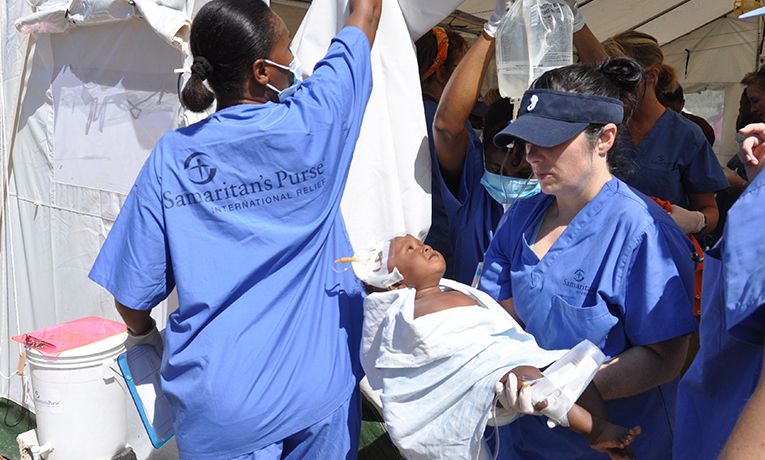 Samaritan’s Purse holds U.S. and international trademark registrations in SAMARITAN’S PURSE, the cross and arc logo, OPERATION CHRISTMAS CHILD, the Operation Christmas Child flying shoebox logo, WORLD MEDICAL MISSION, the globe and caduceus logo, OPERATION HEAL OUR PATRIOTS, THE GREATEST JOURNEY, and others. Samaritan’s Purse claims common law and state trademark rights in “Helping in Jesus’ Name™”, “Children’s Heart Project™”, and others. Collectively, the Samaritan’s Purse registered and unregistered trademarks are referred to as the “SP Trademarks.” All rights in the SP Trademarks are reserved by Samaritan’s Purse. The SP Trademarks may not be used except to promote the humanitarian services and/or raise funds on behalf of Samaritan’s Purse and its programs. Use of the SP Trademarks to raise funds for any commercial purpose and/or for any non-profit other than Samaritan’s Purse is strictly prohibited. The Copyrighted Materials may not be used in such a way as to imply partnership with or endorsement by Samaritan’s Purse, to promote or advertise commercial goods or services, or to raise funds for or promote any other non-profit. All uses of the Copyrighted Material not expressly permitted hereby are prohibited without the written permission of Samaritan’s Purse. To download a copy of these graphic files, right-click on the logo art above and select “Save Image As…” or “Save Picture As…” from the drop down menu. Other SP Trademarks or logos may be available upon request. Please contact SP Permissions at sp-permissions@samaritan.org. • Your name and the name of the organization making the request if not an individual. • Your complete address, including the city, state and ZIP code. • Your phone number and e-mail address. • Information about the Copyrighted Material and/or the SP Trademark that you wish to use and where. Please include a URL if you are requesting use on a website. • A detailed description of the item(s) you wish to use and how they will be used.